First - I must say - CONGRATULATIONS SWEDEN !!! Winner of Eurovision Songcontest 2015!! Great job. I really enjoyed watching the show with my morning coffee on Sunday. 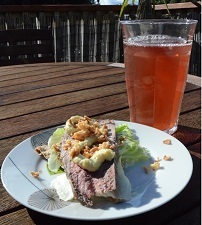 Wellington had such a beautiful day, so afterwards I made myself lunch in the sun. Roast beef on Crispbreadwith Remoulade and roasted onions. Complimented with a glass of nice cold lingonberry juice. YUM! As Scandinavia are preparing to celebrate Midsummer here in the Southern hemisphere Matariki is getting closer. But first - let's hope for a nice long warm Queens Birthday this coming weekend. A creamy white salad dressing with lots of cucumber. A classic condiment for the Scandimavian sausage. What can taste better on a cold winter day? Don't forget tofollow us on Facebook to stay up-to-date with all the latest news and information!